1. Preheat your oven to 400 degrees. Chop the veggies and grease a large baking pan. Cook the pasta according to package directions. 2. Add 1 cup of the almond milk and olive oil to a small bowl, then add the breadcrumbs, salt, and nutritional yeast to another small to medium bowl. 3. Dip each piece of eggplant and yellow squash into the bowl of almond milk and then coat with breadcrumbs. Place them on the baking sheet. Add additional salt/seasoning as necessary to taste. Bake at 400 for 20 to 25 minutes, until golden-brown, turning once about half way through. NOTE: if you're using Daiya cheese, sprinkle it on top of the eggplant during the last 5 minutes or so of baking. 4. While the eggplant is baking, add the garlic and red peppers to a skillet with 1 cup of water. You can also add other seasonings: paprika, cayenne, parsley, rosemary, etc. Water saute on high until the peppers have softened, about 10 minutes. 5. Add the peppers and garlic to the food processor with a tbsp. of oil, the fresh basil, and the remaining almond milk. Process until smooth and creamy. 6. 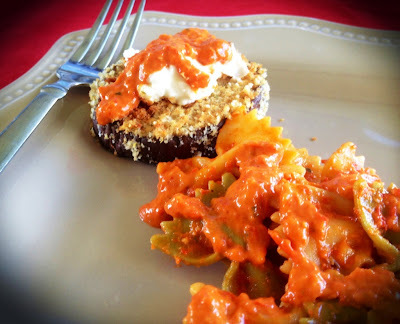 Once the eggplant is done and cooled a little, add it to pasta with the red pepper sauce (you may not use all of the sauce) and "cheese" on top. I hope you like it! PS: More fun MoFo stuff to come! thanks for stopping by my blog and for mentioning it in this post, so sweet! I love egpplant "parm" and yours look so delish! ♡ Aw thanks. I can't wait to make that cashew cheese.